Whether you're still struggling to get over the loss of Google Reader or you want to try out RSS subscriptions for the first time, you can set up Gmail as a makeshift feed reader in just a few minutes. We've outlined the steps you need to follow to turn your inbox into a news ticker below. While it wasn't built as an RSS reader, Gmail certainly does a fine job nevertheless. You can filter your feeds as you like, star articles for later reading, catch up on mobile devices, and use the app's powerful search capabilities to browse through archived content. IFTTT is one of our favorite Web services, allowing users to plug different online apps and sites together with no coding required. Through a simple step-by-step interface you can create customized 'recipes'—each one involves a trigger ("if this") and a resulting action ("then that"). You can use it to get SMS weather alerts, duplicate status updates, back up your photos, control your home lighting and a whole lot more. Facebook, Instagram, Dropbox, Google, Tumblr, Evernote, and dozens of other popular services are supported, and there are also free apps available for iOS and Android to extend IFTTT's capabilities even further. If you're new to IFTTT, sign up for a free account and then click the Create button at the top to start building a recipe. Choose Feed as the trigger channel then pick New feed item. Enter a valid RSS link—such as http://feeds.gawker.com/gizmodo/full—and click Create Trigger to complete the first half of the process. That's the "if this" section. Next comes the "then that" part. Select Email as your action channel (not Gmail) and if you don't already have an email address associated with IFTTT then you'll be prompted for one. Select Send me an email as the action (it should be the only option available) and you can customize the layout of the emails you receive. 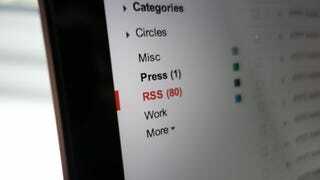 Various parts of the RSS feed you've chosen, such as the feed title, content and author, can be included. Click the plus symbol to the right to add new feed elements. If you don't want to play around too much with this final configuration screen then the default values work fine. However, we would recommend adding a unique identifier to the email subject—such as "_RSS"—to help you filter these emails as they arrive in your inbox. Click Create Action then Create Recipe and you're all done. Repeat the process for each feed you'd like to subscribe to. With the recipe created you'll start to see emails from IFTTT roll into your Gmail account whenever new content is posted to your selected feeds. How you deal with these emails is up to you, but we suggest setting up a filter to keep these messages away from your primary inbox. You can create new filters from the Filters section of the Gmail Settings page on the Web. In the example above we recommended appending "_RSS" to each of the incoming emails, and you can use this as the basis of your new filter. You can take advantage of one of Gmail's built-in categories to organize the RSS feeds as they arrive or create a label of your own, and the filter tool also enables you to immediately archive matching messages. In our case we set up an "RSS" label and set incoming feed emails to skip the inbox. This means a count of unread RSS feeds appears in the label list on the left-hand side of the Gmail interface. Clicking the RSS link on the left displays the unread messages, while entering "label:RSS is:unread" in the Gmail search box shows only those updates that haven't been viewed. There are plenty of opportunities for customization here. For example, if you have one particular RSS feed that you want to stay on top of, you can assign a different tag to the subject header in IFTTT, then use a Gmail filter to mark these emails as important and keep them in your inbox. There are numerous advantages to using Gmail as your RSS reader, even though it's not primarily designed for this purpose. For a start, you have Gmail's advanced search capabilities on hand if you ever need to look back through your feeds; this is particularly useful if you subscribe to RSS feeds that provide the full text of the accompanying articles. An advanced search such as "label:rss before:2014/03/01" can be used to clear out older RSS feeds and free up some space in your Gmail account. Simply run a search for RSS updates older than 3 months or so, then delete all of the messages that appear on screen. Then there's Gmail's integrated starring feature, a ready-made way of marking RSS feeds that you want to come back to later. You could use it as a basic replacement for Instapaper or Pocket, highlighting articles of interest that catch your eye so you can return to them whenever you have the time. Finally, there's the mobile aspect: Gmail is available just about everywhere, which means so are your RSS feeds. You can catch up with your reading through the Gmail app for iOS or Android or by loading up your inbox in any mobile browser. And of course your read/unread messages are synced across all the devices you use. It's not a solution that will suit everyone but it is very robust and flexible. You have control over how your RSS emails are formatted, how they are dealt with, and what you do with them once they've turned up. Bending Gmail to your purposes just barely taps into IFTTT's potential, but it's a great place to start getting your news where, how, and when you want it.